The old saying "don't confuse motion with movement" applies more than ever in the marketing world today, especially when it comes to content marketing. A few years ago you couldn't go anywhere without hearing about content, how it was king and how it was at the heart of everything you did as a marketer. As we move into 2017 there is nothing I can see on the horizon that knocks content off its throne. Truly any campaign or tactic you are planning involves high-quality content relevant to your audiences. According to a recent Forrester report, based on a survey of marketers, no single tactic produces better results than any other. Everybody is doing everything with roughly the same results. The differentiator according to almost everyone surveyed is the value of the content itself. Because marketers know this, we are all madly rushing to produce as much content as possible, as fast as possible for as many channels as possible, until the content budget runs dry. This isn't necessarily a problem if it works. "Don't fix what ain't broken" as they say. The reality is that most marketers don't really know. Having analytics in place that measures the true impact on the organization - building brand, improving customer experience, driving revenue is still something that many organizations are just starting to wrap their heads around. Yes, we all know this, and yes, there are some great technologies out there that can help. Building your organization's analytics capacity is important, more like table stakes at this point. At a high level when Forrester asks marketers if their content is valuable for their customer, they usually answer "yes." But when actual customers are asked, they answer that the content is "useless." So not only are we killing ourselves to produce more content, we are also delusional about the impact it is having. Going back to my first point, I think there is something else we can do to help. Sometimes we need to slow down to go fast. I'm not talking about taking your foot off the gas or losing focus or intensity but slowing down enough to be more strategic -- spending time on things that are important but not necessarily urgent. There are many examples in life where doing less actually gets us further ahead. I spend a lot of time speaking with marketers. I start asking about how much time and effort go into figuring out personas, audiences, and buying journeys. Or aligning the company around the customers' experience not lines of business or channels. Marketers acknowledge the importance of these things, but usually say they need to do more. Most have plans to spend more time on this in the future. When I ask: How much time is spent thinking about why a certain piece of content is being created? Or, what is the intention behind each piece of content and what is its desired impact? How will they know if the content has that intended impact? I get lots of head nods in agreement that they should be doing these things. Those nods quickly turn to head shakes when I ask them if they are actually doing them. I believe if we slow down just enough to create space in our day and our minds so we start thinking about the why of our content and investing in ways to measure the true impact - we will probably find we can produce less content for fewer channels, while increasing quality and relevance and ultimately, results. In our fast-paced, multitasking, do-more-with-less, sleep-when-you're-dead culture this may seem counter-intuitive or even impossible, but I truly believe this is the way forward. The alternative is working even harder, even faster, and trying to complete even more tasks at the same time...good luck with that. 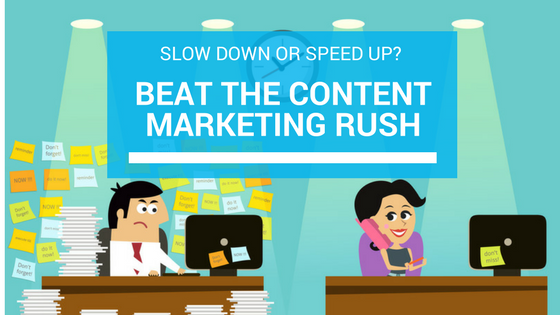 What are your thoughts - are you slowing down or speeding up?